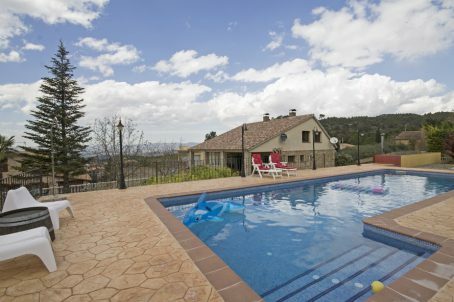 Our house is situated in the small village of Prenafeta, next to Montblanc. Very well situated, at 5 kms from the medieval town of Montblanc, and the highway Ap2. Lots of possibilities to visit in the neighbourhood: Poblet at 17 km, Santes Creus at 25 km, Reus at 35 km, Tarragona at 40 km, Costa Dorada at 35 km. Several ‘natureparks’ e.g. Poblet, Montsant or Els Ports. Ideal for excursions by bike, car or walking trips. * We are 'Superhost' for Airbnb. Why is it worth to visit us? The location, the tranquility, our view on Montblanc and the neighbourhoud, … can’t be explained… you have to see and experience for yourself! Since 2013 we have adapted this authentic house with all the necessary adjustments. Convince yourself of our environnement, our large pool, the status of the house, … If you would like, you could move straight into this house.